Putting waste to good use through recovery and recycling solutions. To create a next-generation, customer-centric website. SITA, a subsidiary of SUEZ Environnement, is a leading provider of waste management and recovery solutions for businesses, local authorities and individuals. 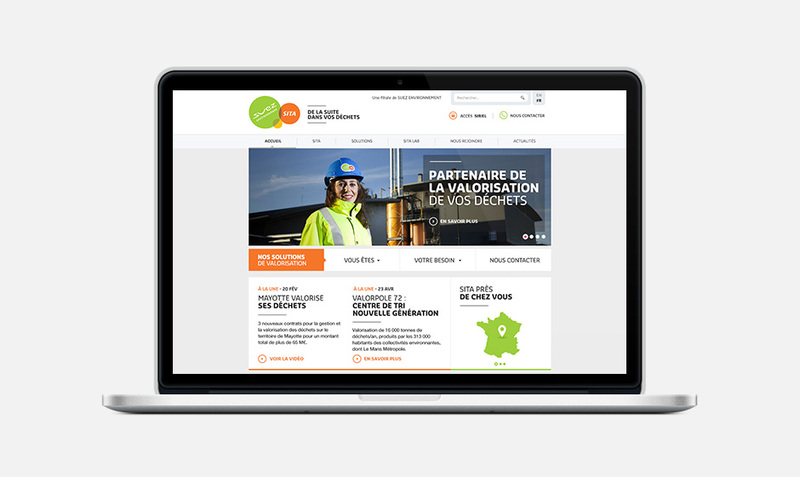 SITA’s new web platform is a one-stop shop for all the company's expertise and solutions in France. It contains detailed information and useful contacts for waste recovery services, categorised by customer type. One of the core aspects of this project was to integrate local and dedicated websites and to place the focus firmly on customers. It involved restructuring existing information and creating specific journeys for different customer types – while reflecting the company's human and social values. 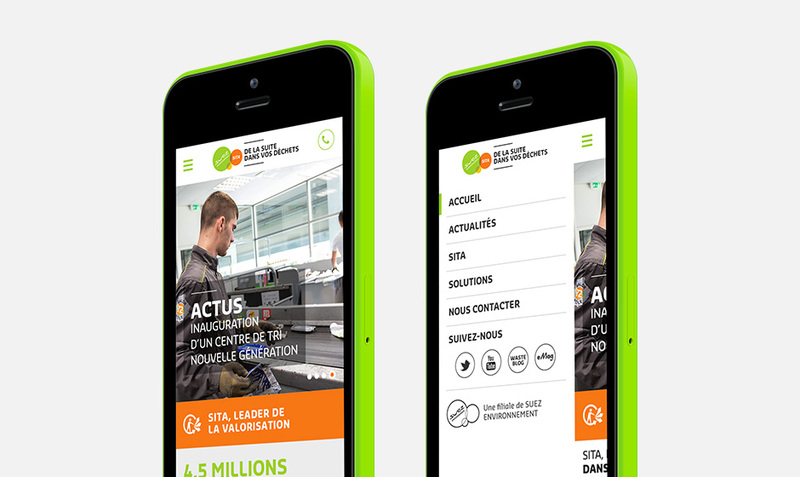 We provided SITA with consulting, ergonomics, design, SEO and technical expertise solutions to help develop the new website, in line with the group's technical architecture and visual style. Manufacturing and service companies, local authorities, individuals and press and institutional contacts all have specific reasons to get in touch with SITA. To make sure customers find the right person within the company's sales agencies and industrial centres, we opted for a dedicated contact module on the home page, linked to a pre-existing SITA contact database. Understanding existing strengths We worked with SITA in project mode to analyse the existing system, carrying out audits and interviews at all levels of the organisation (existing website administrators, senior management, marketing and sales, HR and communication), to identify needs and secure buy-in from in-house staff. During this key phase, we were able to identify genuine needs, collect precious information about the company's waste recovery positioning, and ensure that our project took account of all business line expertise. We then set up a steering committee and a series of working groups involving all functional divisions, along with the company’s regional expert teams and business units. Developing the website’s positioning We structured and categorised this information in a way that effectively positions SITA’s expertise and customer solutions. We used a “layered mosaic” style layout for each key theme, with visitors able to access additional information, technical content, and links to information in other formats. We included pictures of people working on-site to add a human dimension, showcasing the company’s service mindset and local touch. 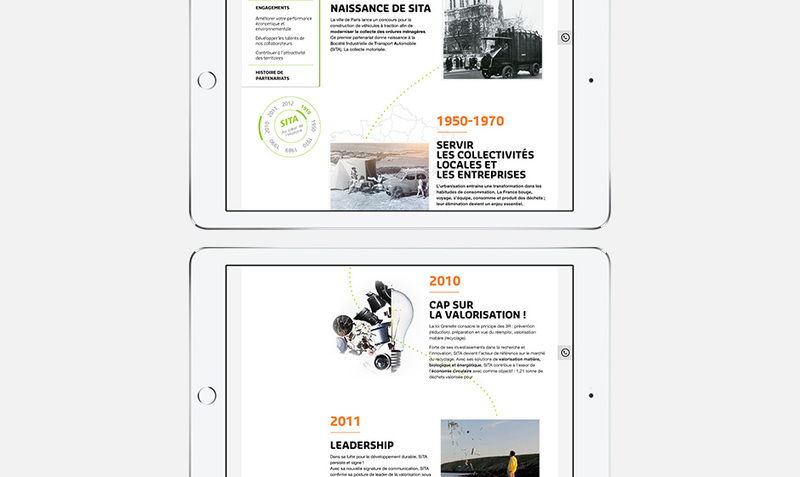 Working within SITA’s technical environment We designed the platform so it could be accessed via tablet and mobile. We opted for adaptive rather than responsive design, and developed a specific website that reflects modern-day mobile practices. www.sita.fr  fits seamlessly into SITA’s technical environment and meets the group’s stringent security standards. Building a functional, appealing, multi-device and dynamic website We needed to make sure that SITA could update the website and upload content in-house, so we produced a set of best practice guides and developed the site using WordPress – an easy-to-use system that is ideal for dynamic content. A customer-centric flagship website that reinforces SITA's leadership and expertise, with a clever contact module to ensure customers get a personal reply. Our decision to overhaul our website was guided by a number of imperatives. We wanted a multi-device one-stop shop for all our waste recovery solutions, and a dynamic information portal where we could post news and details of our innovative products and services. Niji worked with our functional and operational experts in project mode, developing a customer-centric website that has allowed us to quickly strengthen our positioning and our online visibility. It’s the perfect platform for developing a rich, dynamic digital echo system. We overhauled the national web portal and designed the new health identity (design and content integration). We developed a print and web identity, along with an editorial and visual style. When major culinary greats come together, they do so in a sumptuous and welcoming world that promotes exceptional experiences. 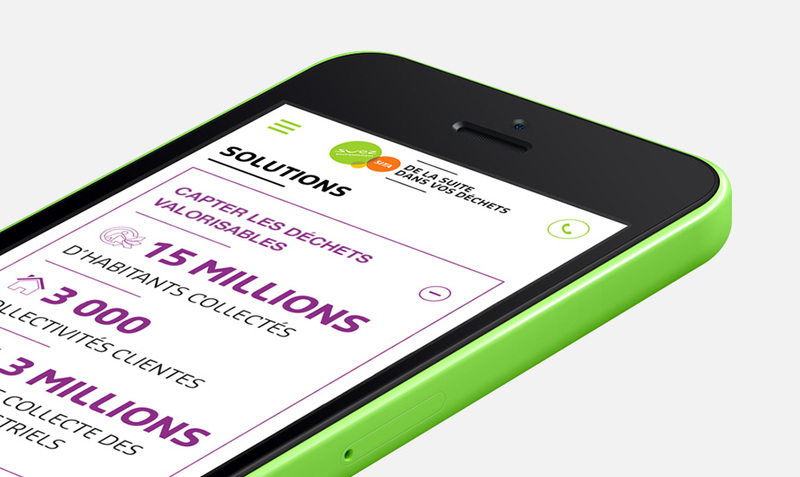 We offered digital support and played an active role in Crédit Agricole's incubator for French start-ups. We created the web portal and worked on future actions, to enhance visibility and develop new business opportunities. 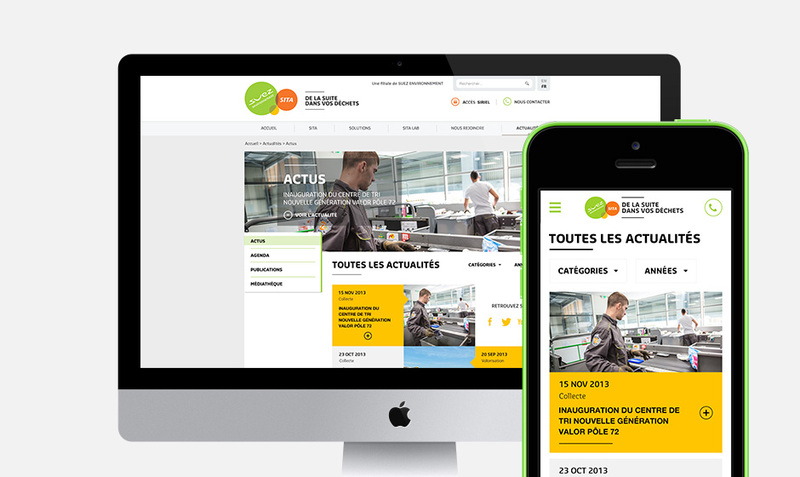 We overhauled the central website for notaries’ offices in the Paris region. As well as information and advice, we also created a series of practical tools for the portal.